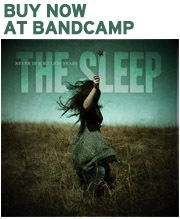 In a year-end review of Cincinnati music, CityBeat magazine has named “Never in a Million Years” by The Sleep as one of the best albums of 2009. Read the full article here. We are honored to announce that The Sleep has been nominated for Best of 2009 Cincinnati Entertainment Award (CEA) in the “experimental/electronic” category. The band is very surprised and excited and are asking fans to go to the CEA site and vote. And you don’t have to live in Cincinnati to vote! Voting continues until mid-November.